Collecting Trends: Modern and Contemporary Paintings | Skinner Inc. 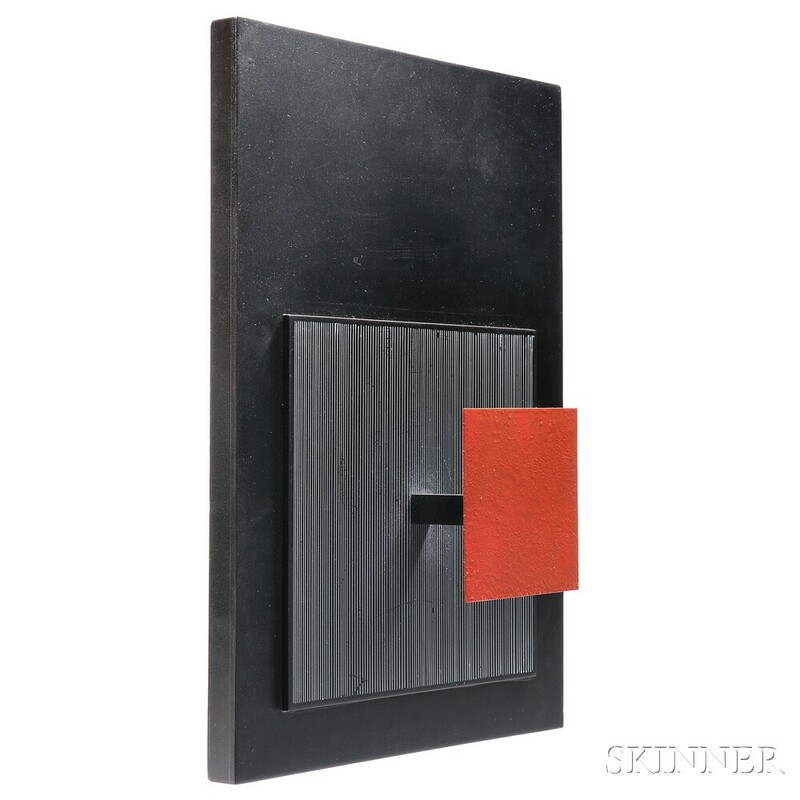 Highlights of Skinner’s May 29th Fine Paintings and Sculpture auction included three works by modern artists that each exemplify important aspects of mid-20th century art. The artist’s international origins—Canada, Russia, and Venezuela—are fittingly emblematic of the global nature of today’s art market. 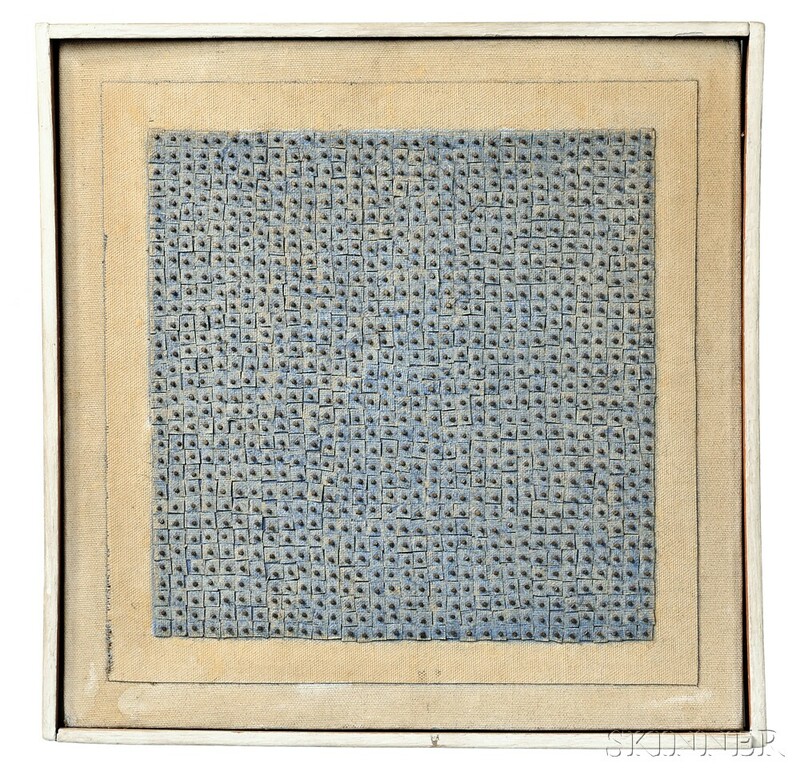 Agnes Martin, Canadian-born but formed as an artist mainly in New Mexico, was a part of the Abstract Expressionist movement, although her works were more contemplative than many of her colleagues. 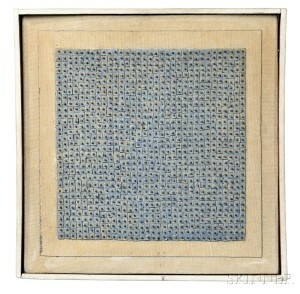 In the late 1950s she began to develop the square, grid-like compositions of her mature style. Her grids were far from rigid, and were created through intersecting horizontal and vertical elements. These elements were generally surrounded by a border, giving her compositions a finite quality. Martin generally connected her geometric compositions back to the natural world through her titles. All of these quintessential elements are present in Blue Flower of 1962. Here, the quarter-inch pale blue canvas squares are imperfect and appear to have been cut by hand. Like the nails that hold them in place, these tile-like squares are not perfectly aligned. The result is a seemingly paradoxical ideal of perfection through imperfection. In spite of their geometry, Martin strove to create in the viewer that sense of a quieted self; this quiet allowed the viewer to perceive perfection and thus beauty. The need to create the quieted self was so strong that Martin destroyed most of her earlier works since they didn’t meet this standard. Russian-born Pavel Tchelitchew was one of the many internationalists who figured prominently in the development of 20th century art. He studied, lived and worked in Russia, Germany, France, the United States and Italy. In 1929s Paris, Gertrude Stein brought the young artist into her elite intellectual circle. 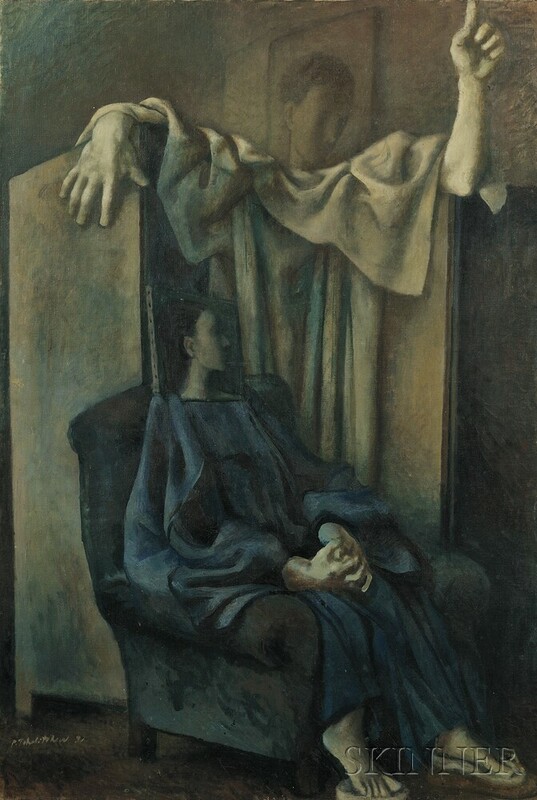 Stein introduced him to Picasso’s early paintings of 1905-06, which influenced Tchelitchew to flatten pictorial space and limit himself to monochromatic variations of the same color in many of his works. Tchelitchew constantly experimented with new styles: cubism, constructivism, neo-romanticism, surrealism. A distinctive quality of much of his work is an element of ambiguity, as in his Annunciation. What is the nature of the space that the two figures occupy? A folding screen conceals the setting and thrusts the angel forward to crowd the seated figure. Where in time does this scene occur? The angel’s drapery is traditional, even classical, yet Mary is seated in a modern-day upholstered armchair. Jesus Rafael Soto’s education and career took him from his native Venezuela to France to the United States. His distinctive abstract works included sculpture, paintings, and environmental installations such as his renowned Penetrables, groups of hanging transparent filaments that invite—indeed, demand— physical interaction with the viewer. Soto was a prominent figure in both Op art, which employs visual tricks and optical illusions, and Kinetic art, works which incorporate movement. Both of these art movements sought to create works that would engage viewers not just intellectually but physically, calling for multi-sensory responses from the audience. His 1966 Op art creation Petit Carre Rouge is much more than the “little red square” of the title. The three-dimensional piece combines wood, metal, and paint. Fine black and white parallel lines create movement visually through a moiré pattern that calls on the viewer to decipher a kind of code that shifts as the spectator’s viewpoint changes ever so slightly. View current offerings of Modern and Contemporary Paintings in our September 11th Fine Paintings & Sculpture auction. This entry was posted in Blog and tagged American art, Andy Warhol, Claes Oldenburg, Contemporary Art, contemporary artists, David Hockney, european art, fine art, Fine Paintings, Fine Prints, fine sculpture, modern art, Photography, pop art, Robert Rauschenberg, Roy Lichtenstein by Robin Starr. Bookmark the permalink.